Ecuador has announced a state of emergency in the Galapagos Islands, a week after a cargo ship with hazardous materials ran aground there. The Floreana - which ferries food and other supplies to the Unesco world heritage site - was also carrying 45,000 litres (10,000 gallons) of fuel. Booms have been used to contain a fuel spill in the pristine waters. The islands - famous for their unique flora and fauna - lie some 1,000km (600 miles) off Ecuador's Pacific coast. 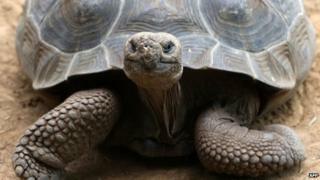 The emergency "will allow authorities to have immediate [financial] means to deal with the situation", a Galapagos National Park spokesman told the AFP news agency. The ship's hull was reportedly destroyed in the incident on 28 January. Rescue teams are now trying to refloat and remove the vessel. This is not the first such incident. Last year, another cargo ship ran aground.